Raven Collar, Revisited. If you think you’ve seen this necklace before, you’re right. I made one in almost this exact color way, and declared it Mine! Mine! Mine! Until the Artist Studio Tour in Reno, where a lovely woman bought it. She is as much a fan of purple as I am, so I was sure it would be worn well, worn often. Alas, that left me without a purple necklace. A problem now solved. 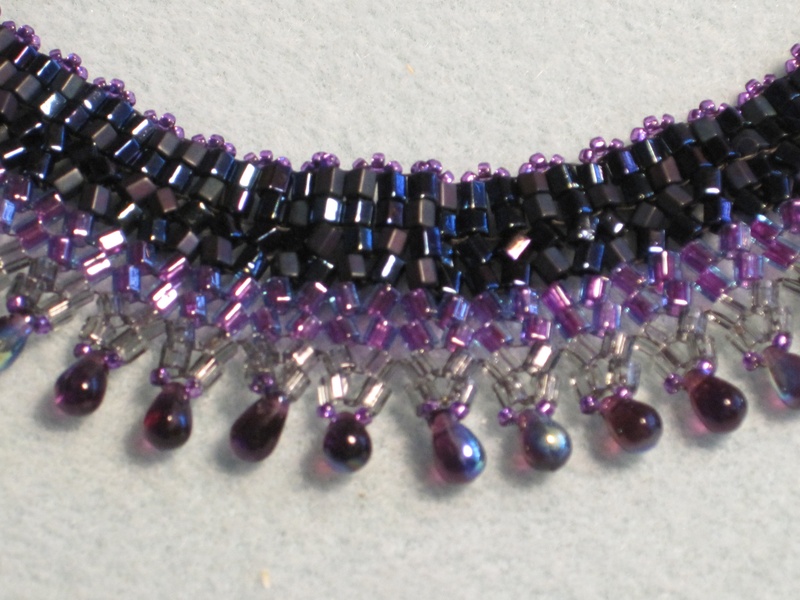 This is not an exact copy, as there weren’t enough of the matte dark purple beads. Nor could I find more, search as I might. Time to improvise. I found the same color at an on-line store in a shiny finish. Mixing the two, matte and shiny proved the most opportune solution, making the first dark stripe more visually interesting. The rest of the colors were finished the same as the original. 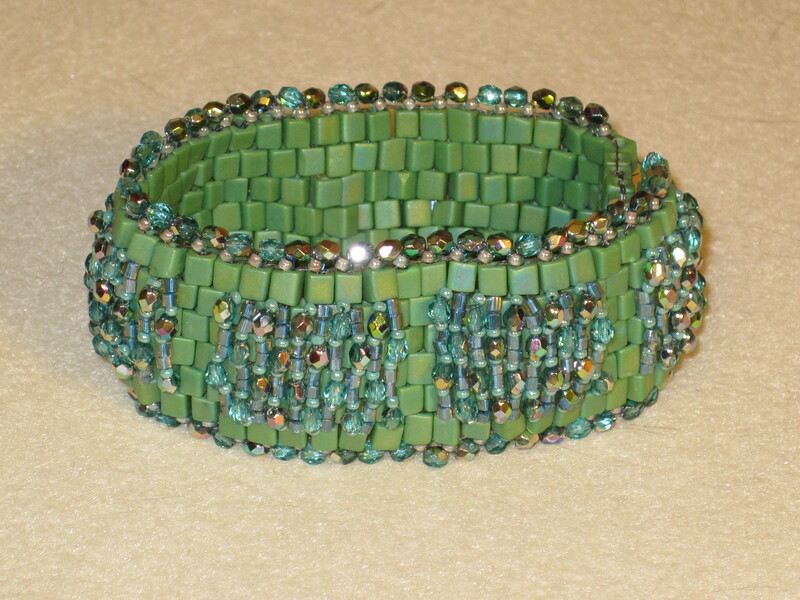 Another in the series of netted bracelets. This time in turquoise and gold. That’s real gold, too! I realized I’ve been treating my beads like my fabric, saving “the good stuff” for something special. Who knows what that something is? Certainly not I. So, it was time to break out the extra sparkly bits, and see what they could do. These are (I think) 22 kt. Not solid gold, mind you, but flash dyed, or however they adhere gold to glass. More than likely the same process used on Great Aunt Ethel’s fine china. I used a matte ivory to offset the gold. 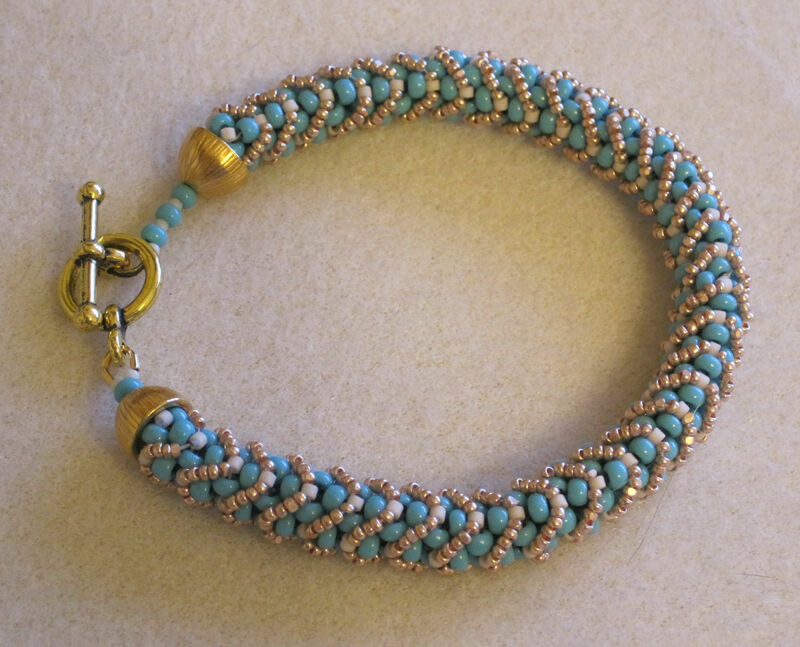 This is a color combination you don’t see very often – turquoise and gold. Matte. Sparkly. Gothic even. Something you catch out of the corner of your eye when the moon isn’t up. A glint. Another necklace in the collar series. This one with dark iridescent drops as an accent. 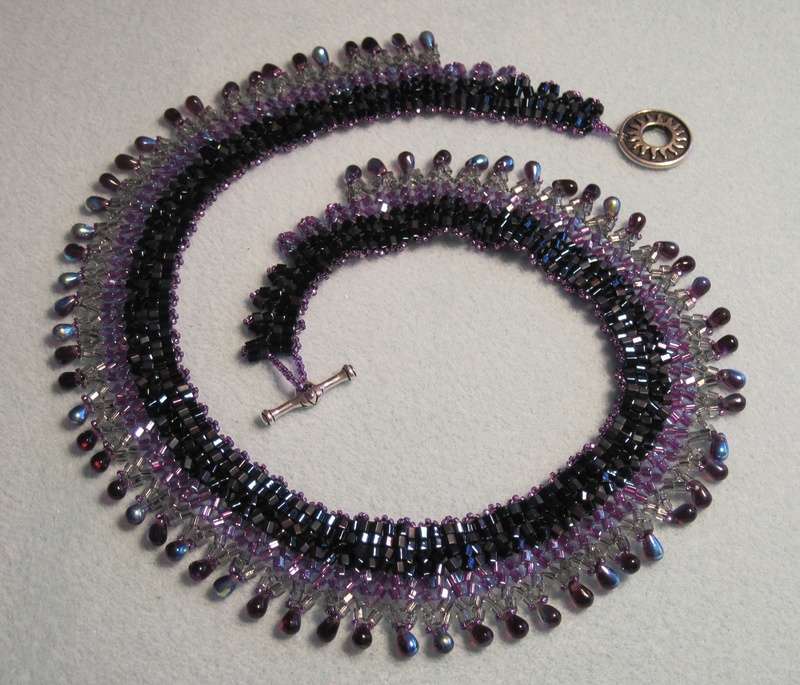 The collar base is matte mystic blue hex beads, moving to a lovely purple, then a transparent grey, accented with silver-lined purple size 15º seeds. I think the moon burst clasp is a nice finishing touch. Not too shiny or too sparkly. The AB finish in the drops plays nicely against the blue of the matte beads too. To borrow a phrase from The Selfish Seamstress, this one is Mine! Mine! All Mine! Another in the collar series. This one sporting bright red holly flowers, complete with brown berries. I know – March is not exactly the time for Christmas colors, but the bright red of the flowers just spoke to me. A siren song for holidays far in the future, if you will. 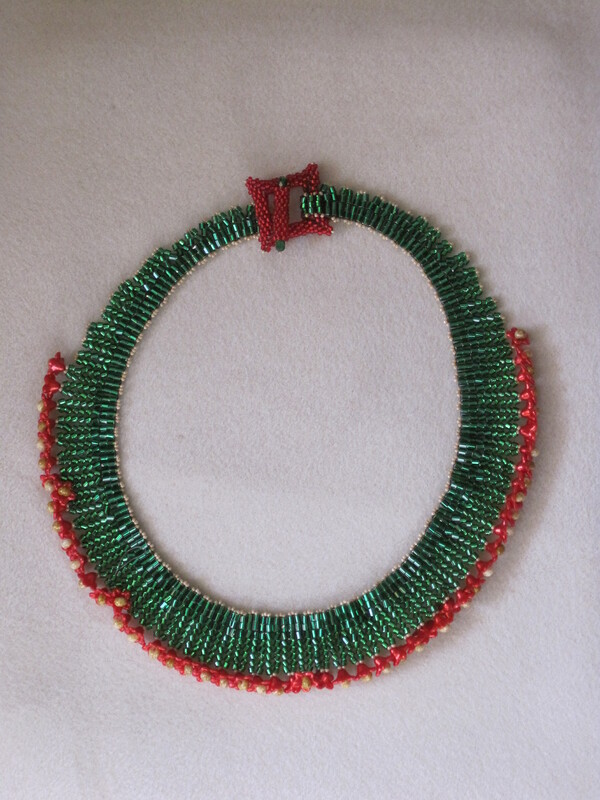 The necklace is made from size 8º hex seed beads with iridescent lucite flowers and tan picasso-finished drops. 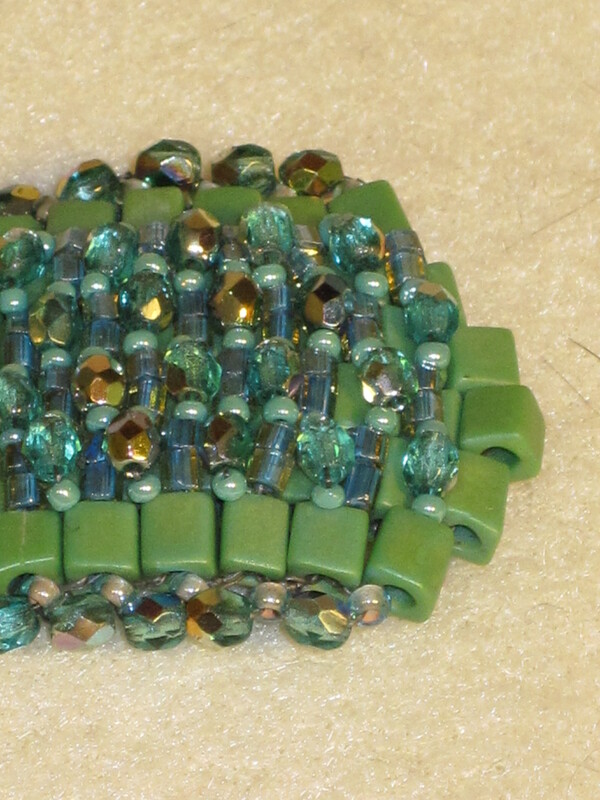 The toggle clasp is size 11º seed beads with emerald crystals. 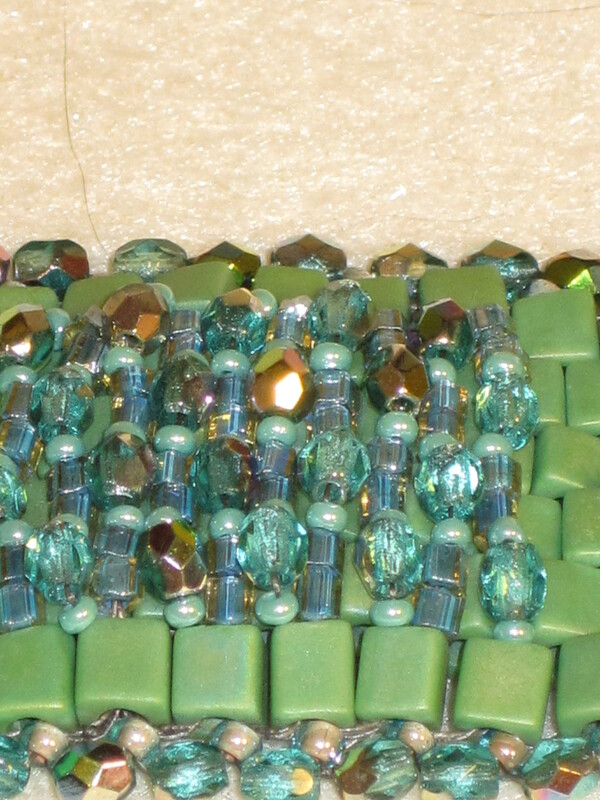 The hex beads are sliver-lined emerald; a very true, solid green. I like the way the flowers lend a textural fringe to the edges. Something a little different. Overall, the piece is quite lightweight. It has a nice feel, supple and strong. Spring, suitable for any goddess, but Ceres in particular, being the embodiment of Spring. She manifests as green shoots appearing on the spindly branches of dormant winter trees. The first pale leaves of a flower, coming up from the ground. A time for growth. Renewal. A celebration of longer days and milder nights. A little something sparkly for the deity. 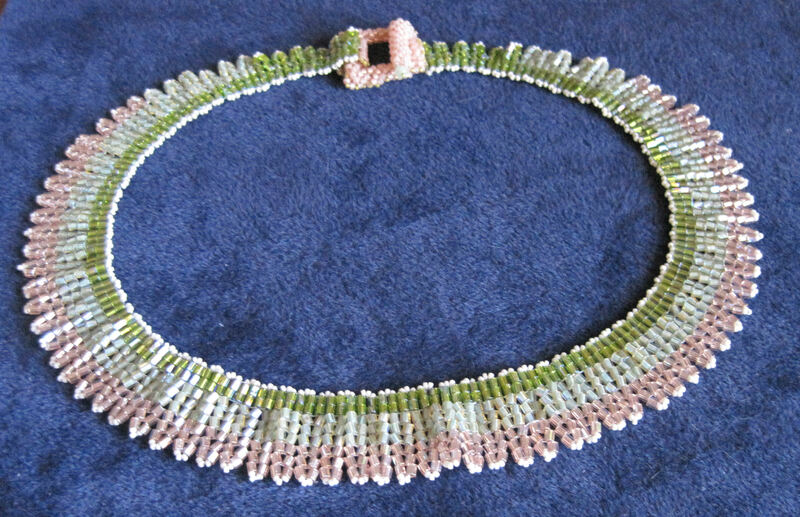 Soft greens and palest peach stitched together into a necklace. Soft and flexible as it lays along the collarbone, barely noticed by the wearer. 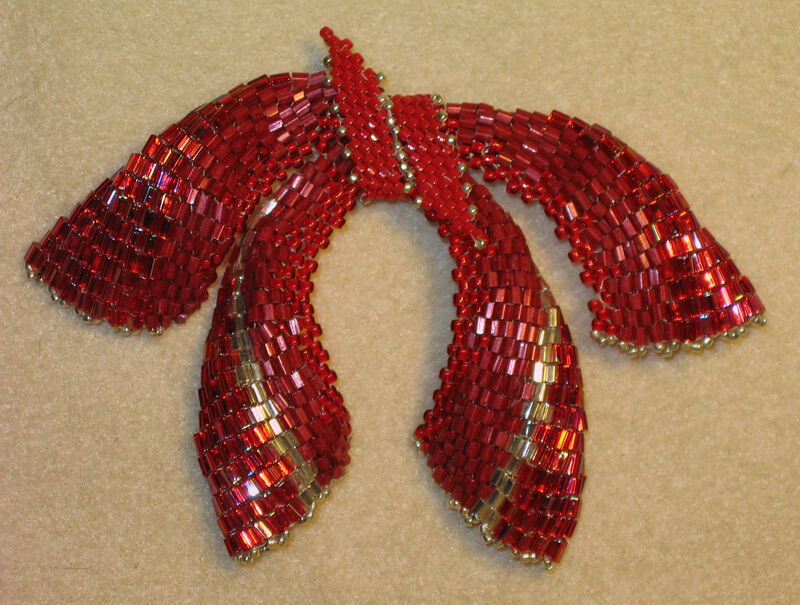 Finished with a hand-beaded toggle, capped with crystals. 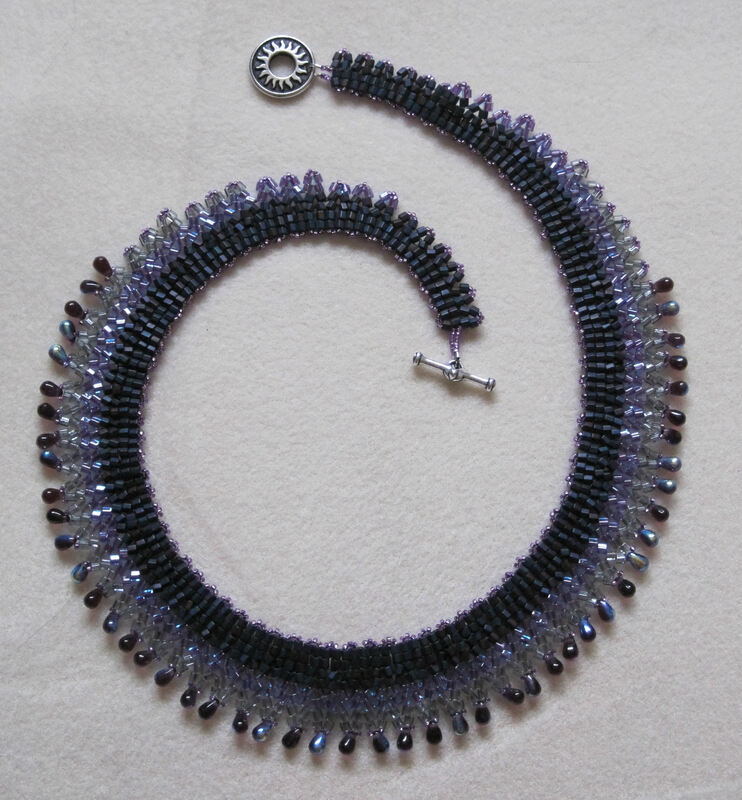 Size 8 hex beads in herringbone stitch for the necklace; a combination of size 11ºs in peyote and herringbone for the clasp. I fnished this Friday night, and must say, I am quite pleased with it. 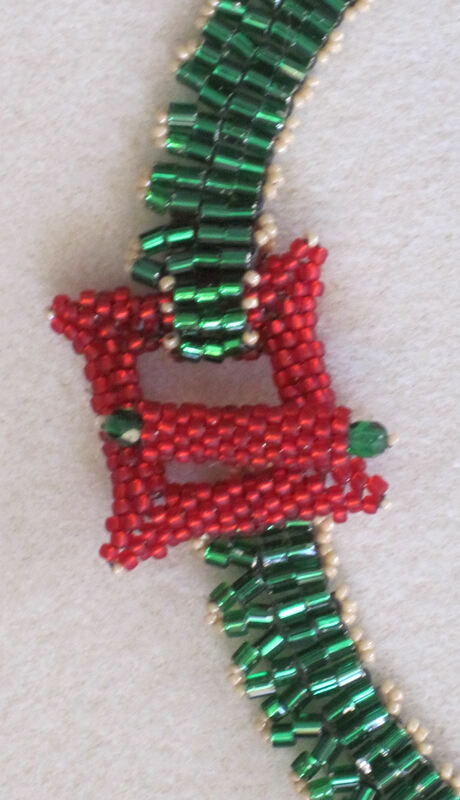 The pattern is from the most recent issue of Beadwork or Bead & Button, I’m too lazy to look it up right now I don’t remember which. 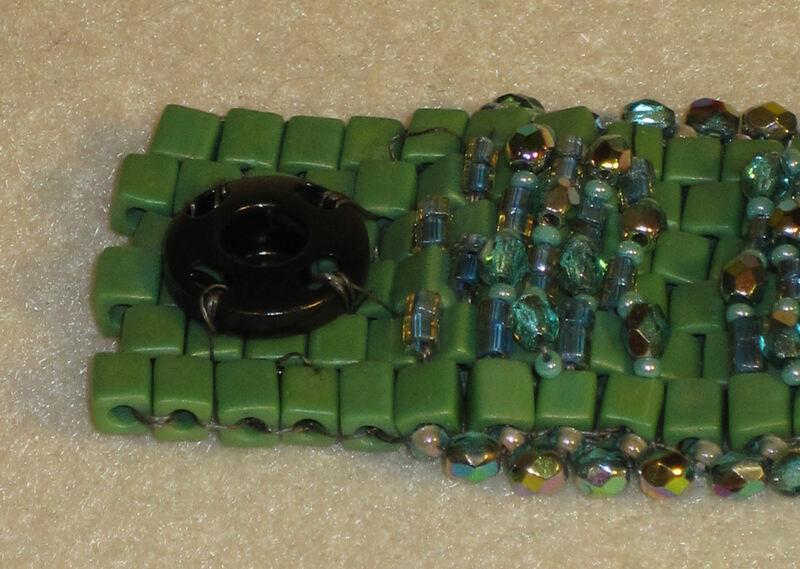 It’s a peyote base made with 4mm matte cubes, then embellished with 10° hex cut seed beads and 3mm Czech crystals. Since my cubes were larger than the crystals, I had to add in some small (size 13°) spacer beads to fill the gaps. I think this enhances the color, and give the overall piece a bit more depth. 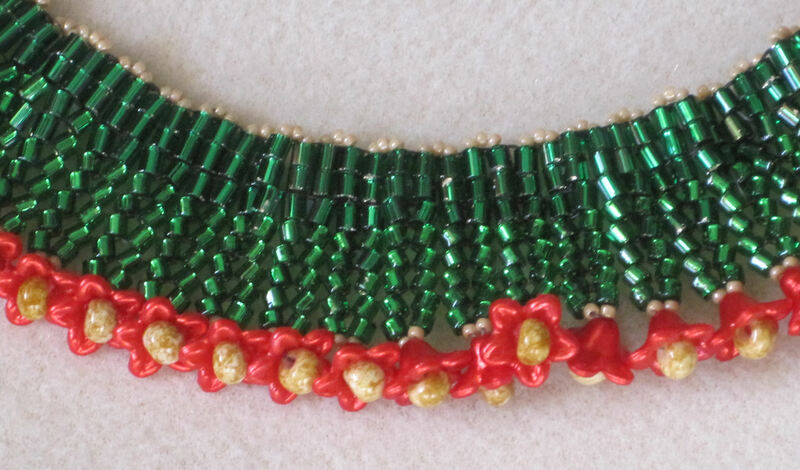 The edge is a standard picot, with crystals and regular seed beads. 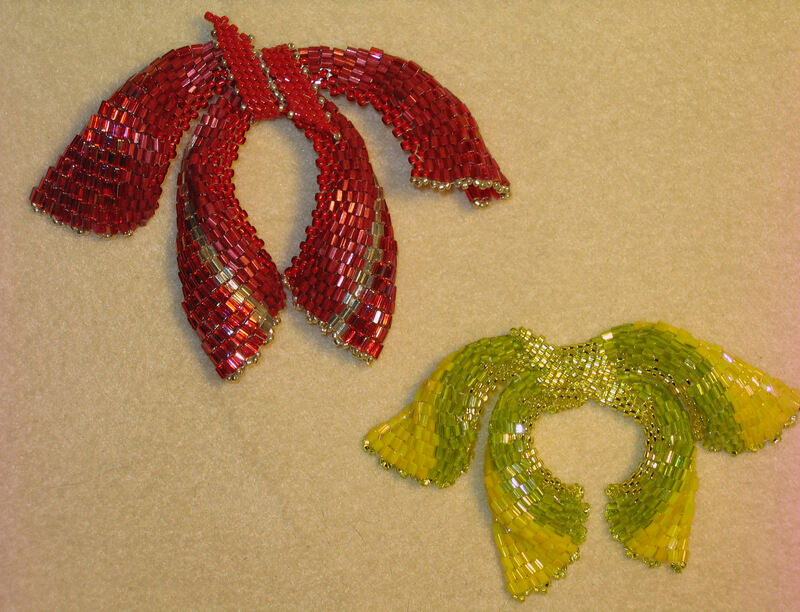 Crystals and hex beads both have sharp edges, which are prone to cutting regular nylon beading thread. I used 6# Fireline to do the stitching. Yes, this is the very same Fireline that’s found in your local sporting goods store, in the fishing aisle. It’s used with fly rods, but has migrated to the beading world with great ease. Fireline is particularly suited to sharp-edged beads as it is a very fine cable, which doesn’t abrade easily. Don’t cut this stuff with your good scissors! It will chew up the blades. This bracelet closes with a big snap! Literally, and figuratively. 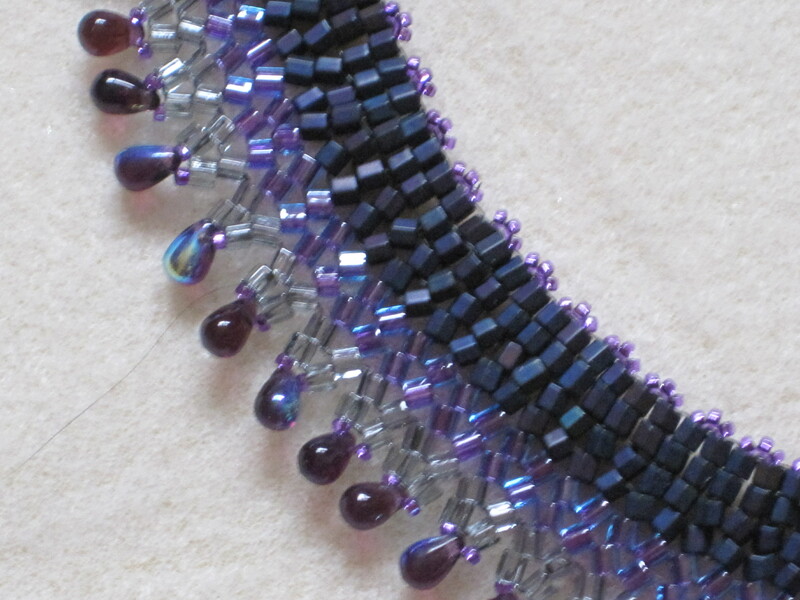 I didn’t extend the picot edging around the tab (front) of the bracelet, as I thought the extra beads might get caught on clothing. I also liked the smooth tab better. Just my tastes. If you look closely at the top picture, the bracelet seems to have a wave effect, and it does indeed. The sections that are embellished form gentle curves. Like the various shiny and matte finishes, this adds to the overall interest. While my sewing mojo has left home with no forwarding address, I have managed to remain somewhat creative, which has helped my sanity as well as that of the rest of the household. As they saying goes, “If Mom ain’t happy, ain’t nobody happy”. Isn’t that the truth! However, for the second one, I had the gist of the design, and went out on my own. 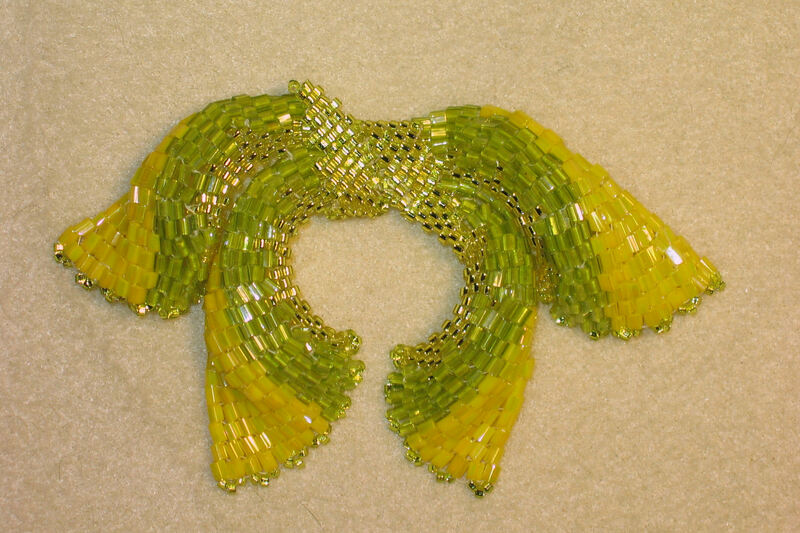 I skipped the delicas all togehter, and used regular seed beads. Much easier to work with – probably helped that the red wasn’t silver lined. Easier to see. The only 10° hex in this piece is the silver. I still had to cull them, to get enough of the right size, but it was easier. The rest of the hex rows I used 8°s, which are much easier to find. Those little silver dots on the edges are beads. Very. Tiny. Beads. These are both lapel pins. I imagine you could attach a strap to them and use them as a necklace, but they are not very rigid. The legs flop around a bit. Flop. One of those technical beading terms.